July 1863 was recognised both at the time and afterwards as the turning point of the American Civil War. The Union victory at Gettysburg in the first three days of the month, and the surrender of the Confederate fortress of Vicksburg in the 4th, ensured that the days of the Southern Confederacy were numbered. Long and bitter fighting still lay ahead but from this time onwards there could be no doubt that the Union would be restored. The role of the US Navy had been crucial in gaining control of the Mississippi – the fall of Vicksburg put its entire length under Union control – and no less important was the close blockade of the southern coastline which was to strangle Confederate commerce and strategic imports. Given this concentration of US Naval power in American waters, it is surprising that one of the most dramatic naval actions in July 1863 was when the USS Wyoming engaged Japanese forces. The background to this action was the Union decision, from the start of the war, to maintain a six-ship Pacific Squadron to protect American interests, strategic and commercial, over this vast area. The first concern was to ensure that the Confederacy should not gain a foothold at any point on the Pacific coast. As this threat receded it was replaced by that of Confederate commerce raiders. The most successful of these, the CSS Alabama, operated on a global basis, including the Indian Ocean and the South Pacific. The American whaling fleets were considered especially vulnerable and the squadron’s patrols extended across the North and South Pacific, from Alaska to Chile and as far west as Australia and the Chinese coast, where piracy was a major problem both then and in many years to come. Entering service in 1859, the USS Wyoming was the newest of the squadron’s vessels. 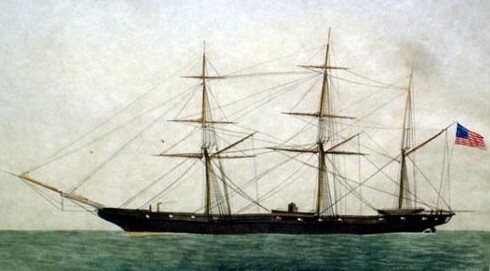 A wooden-hulled steam sloop of 1460-tons and 200-foot length, she was not called after what is now the State of Wyoming (which did was not admitted to the Union until 1890) but rather after the similarly-named valley in Pennsylvania which had been the scene of ghastly massacre of settlers by British-allied Indian forces during the War of Independence. The Wyoming was heavily armed for her size – two 11-inch Dahlgren smoothbores, one 60-pounder Parrott rifle and three 32-pounder smoothbores. She could make 11-knots under steam but auxiliary sail provision made her less dependent on coal supplies and extended her range considerably. The Wyoming’s Civil War was to open dramatically. She was at San Francisco when secession commenced and her captain, a Southern sympathiser, took her to Panama with the apparent intention of committing her to Confederate service. This was frustrated and he was dismissed. On the voyage back to California she struck a reef, was grounded for three days, and had to be dragged free. 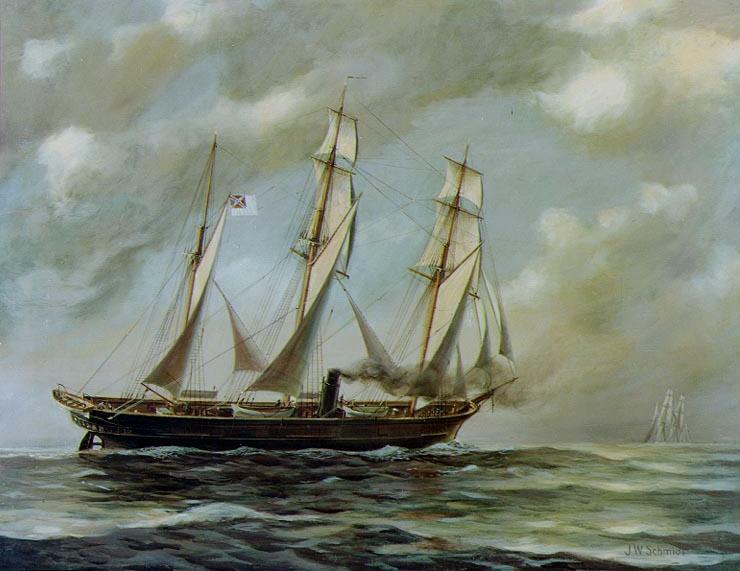 In mid-1862, now commanded by Commander David S. McDougal (1809 – 1882), she was sent across the Pacific to Malaya and the Dutch East Indies to search for the Alabama. In October of that year the Alabama received news from British and Dutch trading vessels of the Wyoming’s presence in the area. The Alabama’s captain, Raphael Semmes, wrote in his journal that he was resolved to give the Wyoming battle and that he believed the ships to be evenly matched. The game of hide and seek that followed did not however lead to an encounter. Trouble that would demand the Wyoming’sattention was however brewing in another quarter. Japan had only been “opened” to foreign trade and contact since 1854 and a major issue in the nation’s internal politics was to be the extent to which it should either modernise, or to continue its existing social and cultural norms while rejecting all outside influences. We know now that it was the modernisers, led in the 1860 by the Tokugawa Shogun, Iesada, who were to prevail but the issue was only decided after a long series of revolts and civil wars. The movement against both the Shogun and trade with outsiders was led by the Choshu Clan from their territory in south-west Honshu. 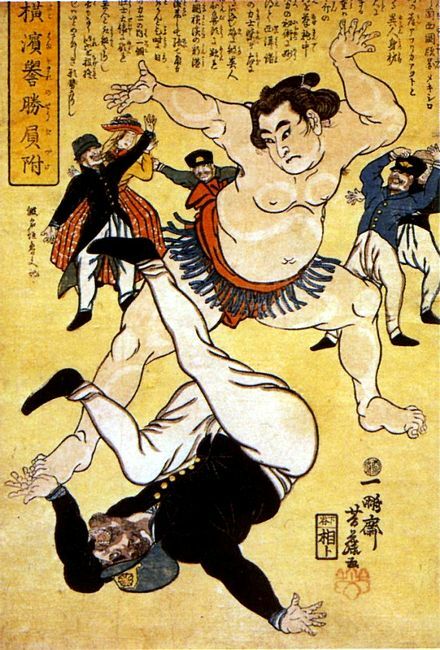 Their policy was summed up in the slogan “Honour the Emperor and expel the barbarians.” The Emperor in question had been a figurehead, and above politics in the preceding period, with political power vested in the Shogun. Now Emperor Komei broke with tradition and issued an edict supporting the “expel the barbarians” policy which was immediately acted upon by the Choshu. They were well placed for this since, with powerful shore batteries, they controlled the Straits of Shimonoseki which divide Honshu from Kyushu, the most southerly of Japan’s main islands. Soon British, French, Dutch, and American traders were coming under fire. Following her unsuccessful search for the Alabama, the Wyoming moved north in 1863. She arrived in Yokohama to find that all foreigners had been ordered to leave Japan immediately and that the Straits of Shimonoseki had been closed to foreign vessels. 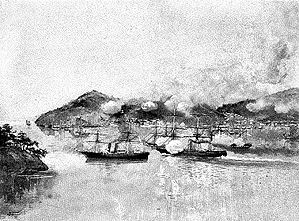 On 26th June news arrived that two Choshu vessels had attacked an American merchantman in the Straits. She escaped without casualties but US ambassador and Commander McDougal agreed that the insult to the American flag was unacceptable. Immediate action was needed if further such incidents were to be prevented. McDougal, commanding what amounted to a one-ship navy, headed south. The Wyoming entered the Shimonoseki Strait in mid-morning on 16th July. She was cleared for action and her guns were loaded. The Choshu coastal batteries – which included five modern 8-inch Dalghrens as well as more antiquated smoothbores – opened fire on her shortly afterwards . The Wyoming opened up in return with her pivot-mounted 11-inch Dahlgrens. 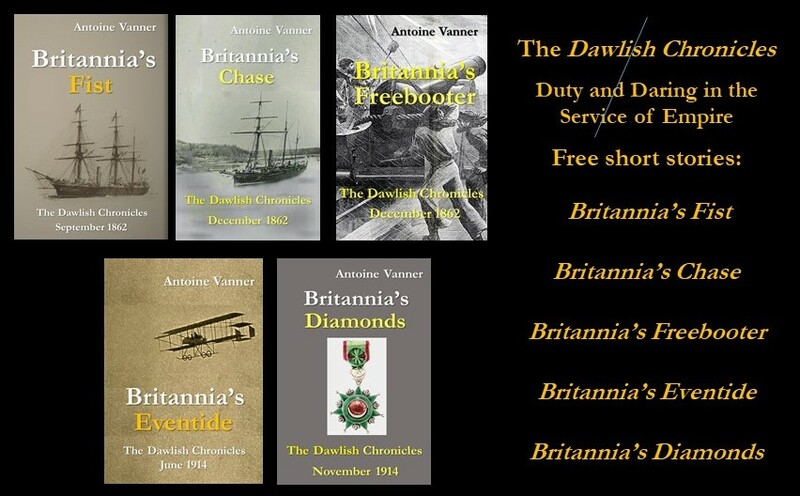 She drove towards three armed Choshu vessels moored at the town of Shimonoseki, all steamers built in the United States and one of them bizarrely named the Daniel Webster after the renowned statesman . 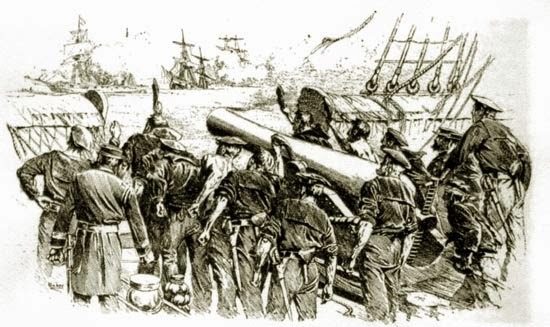 Wyoming took hits she forged ahead, one of them killing and wounding men manning a 32-pounder broadside gun. Lacking charts for these waters the Wyoming now ran aground. The Chosu steamer Lancefiled charged straight for her with the apparent intention of boarding, but Wyoming managed to break free from the mud in time to blast her attacker with her Dahlgrens. The Lancefield’s boiler exploded and she sank. McDougal now concentrated his fire on the two remaining Chosu vessels and some of the shells fired went over and exploded in the town beyond and started fires. During the action the Wyoming took eleven hits on her hull as well as substantial damage to her funnel and rigging. Losses amounted to four killed and seven wounded. 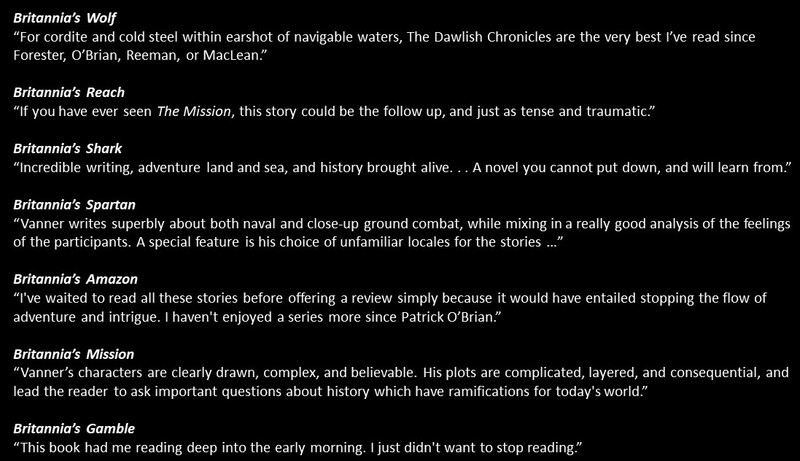 Honour was satisfied and McDougal was pleased that, in his words, “the punishment inflicted (on the Choshu leader) and in store for him will, I trust, teach him a lesson that will not soon be forgotten.” This conclusion was somewhat premature for the Chosu leaders were undeterred. Four days later two French warships, the Tancrede and the Dupleix, also bombarded and landed men briefly to destroy one of the gun batteries. This was still not enough to deter the Choshu and the following year it took a larger campaign by significant numbers of British, Dutch and French warships, with a nominal American presence, to clear the strait. This larger action may be the subject of a later blog. Damage repaired, the Wyoming set off again for the Dutch East Indies to hunt the Alabama. They were never to sight each other, though it emerged later that at one stage they had been a mere 25 miles apart in the Sunda Strait between Sumatra and Java (Where the USS Houston CL-30 was to go down fighting in early 1942). The Wyoming remained in the area after the Alabama left and was later involved in the hunt for the Confederate raider Shenandoah. Her only further action was to be a punitive expedition against Formosan natives who had murdered the crew of a wrecked American merchantman. She remained in active service until 1882. And the quarry that Wyoming hunted so relentlessly but never sighted? The Alabama had an appointment with Destiny, and with the USS Kearsarge off the coast of France tin 1864. But that is a separate story.